Dental implants are small screws designed to replace the root of a tooth and restore the physical appearance and the chewing function of patients with partial or full tooth loss. Dental implants are intended for use in either the upper and/or the lower jaw to support prosthetic devices, such as artificial teeth. 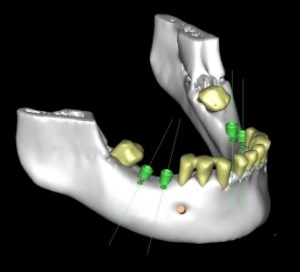 By integrating with the jaw, they enable restorations that range from replacement of one single tooth to an entire arch of bridgework, or as stabilizing elements for over-denture applications. Most dental implants are manufactured from titanium, which is both biocompatible ( suitable to bond with human tissue) and strong. A Comprehensive Service with assessment planning and delivery of the most appropriate implant or alternative solution for your particular needs, combined with on-going preventative care and maintenance programs. All clinicians have specialist training. We provide integrated services ranging from single tooth replacements to multiple and complex full arch tooth restorations and denture stabilisation, using a variety of different materials and techniques. All members of the team are involved from the beginning of treatment in selecting predictable treatment options and delivering durable outcomes for our patients. View case studies. At the Clinic surgical procedures are completed under local anesthesia, with or without intravenous sedation. More complex procedures can be completed under general anaesthetic at UPMC Beacon hospital if necessary. The implant dentistry treatments at the Beacon Dental Clinic are specialist led services. Cases are jointly assessed, planned and managed between the Prosthodontic, Periodontal and Oral Surgery services utilising the latest diagnostic, radiographic and, scanning technology (where indicated). We draw on our established expertise in the area of implant dentistry spanning two decades, combined with relationships developed with our Master Dental Technologists over many years to develop appropriate treatment recommendations. We have assembled the necessary expertise and experience in our team to provide predictable and lasting treatment outcomes for our patients. View case studies. Our facilities, technology and assembled expertise makes the clinic a leading center in the delivery of high quality implant dentistry solutions for a broad range of individual problems. Following completion of treatment we also provide ongoing structured Maintenance and Dental Hygiene programs to help ensure the durability of the services we provide. Dental implants should not be used in patients that have inadequate amounts of bone to permit placement of implants in sufficient size and numbers to support their biomechanical loads (the restorative tooth/teeth to be placed on the implant). Mechanical failures, including fatigue fracture of implants, prosthetic screws, and/or abutment screws, may occur if dental implants are insufficient in size or number to support their biomechanical loads(the restorative tooth/teeth to be placed on the implant), or are not properly positioned. To reduce the risk of overload or fatigue failure, dentists must place the implants and design prosthetics to accommodate the physical or medical conditions of their patients, such as bruxism (i.e., grinding or clenching of teeth), tooth or gum disease or unfavourable jaw relationships amongst many other considerations, which if not addressed adequately, will result in the failure of long-term treatment.